You may have noticed this message popping up when you logged into our BackOffice this week. That's because on Monday we released an updated My Endpoint Groups. The update to this feature will give our customers a deeper look into their endpoint metrics. The updated My Endpoint Groups has significantly more information and offers an overall better customer experience than the first My Endpoint Group that was designed. When customers view the main My Endpoint Groups dashboard, they can see a list of their endpoint groups along with key metrics such as the cost for origination and termination minutes, the number of calls, and the overall cost of the calls. When a VoIP Innovations customer chooses an endpoint group to open, they are provided with even more information and management tools. 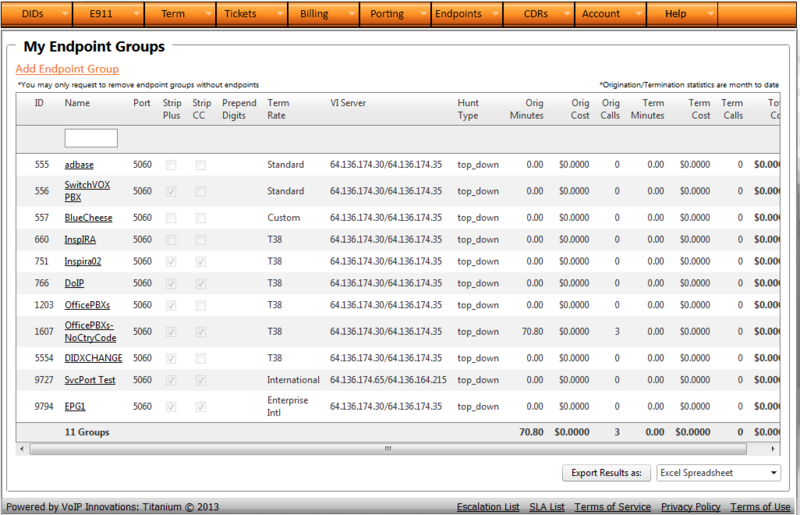 The customers have the ability to configure endpoint group features such as the the group name, Port, choosing to have Strip Plus and Strip CC, add prepend digits, select a Rate Deck, choose a Server, and select the Hunt Type. Gross Profit Margin (GPM) can also be calculated from an endpoint group dashboard and customers can select a date range to see the GPM for a certain time frame. The Current Endpoint Usage for the endpoint group is available in this dashboard as well. This allows customer to have access to the IP Address, Priority Level, Active Status, Origination Minutes, Cost and Calls, Termination Minutes, Cost and Calls, and the overall cost of each endpoint. 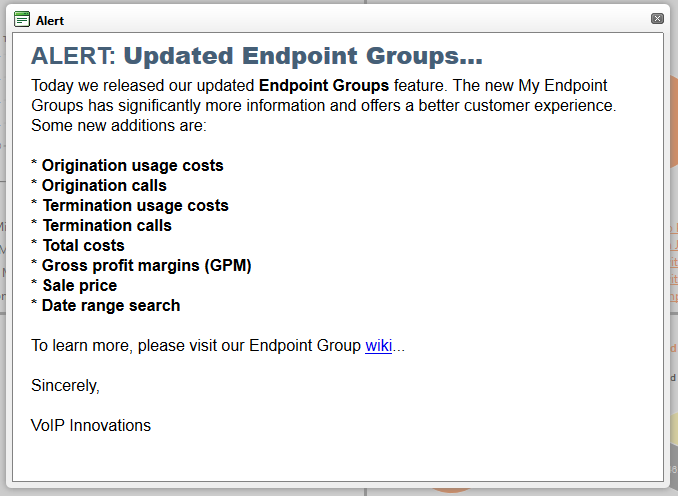 We updated the My Endpoint Groups as a way to make our customers lives easier. It started with My DID groups that we released a few weeks ago and this has taken it one step further. There are improvements on Titanium III being developed every day and the update to My Endpoint Groups is yet another step toward making the most customer friendly BackOffice program on the market.